One of the most common things we hear is, “Oh, I’d love to design my own ring, but I don’t think I can.” Their assumption is that a while a custom engagement ring may be a one-of-a-kind, thoughtful and romantic gesture, it’s probably not an option for them due to lack of budget, time, vision...etc. Not to mention, the whole process can seem intimidating and overwhelming—so it is often written off as wishful thinking. But here at Freedman Jewelers, we are happily setting that record straight. 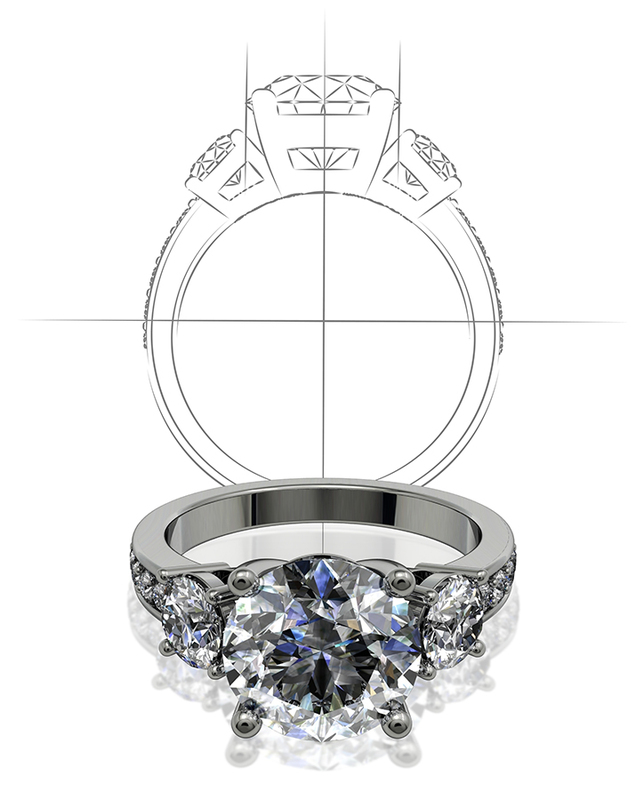 If in your dreams, your dream ring is a custom design...we will make it happen. Unlike others in the industry, our goal is to ensure that a custom-designed ring is attainable for anyone who is interested. We work hard to take eliminate all uncertainty, nerves, and concerns...and in doing so, we make the process both easy and affordable. Oh, and fun! Yes, fun! How? It all begins with the machines behind the rings. By investing in the industry’s latest advancements in technology, software programs, and machinery, our jewelers excel in creating custom fine jewelry designs from scratch, quickly and affordably. From there, it’s all about expertise and relationships. Because while our masterful design capabilities always result in flawless diamond rings and fine jewelry, it’s truly our family-oriented, close-knit team of experts who set us apart from the rest. Above all else, a client’s peace of mind and happiness is of the utmost importance to every Freedman jeweler, every single time. And with that core value at the root of every project, the Freedman’s have proven to be the best in providing helpful guidance and clear understanding every step of the way, effectively erasing confusion, intimidation, and stress from the process all together. The Freedman Custom Design process offers both high end, impeccable craftsmanship and affordable, attainable custom designs. The best part? Many jewelers only offer custom design services. And due to this narrow skill set, the cost of the pieces is quite high. Other jewelers don’t do any custom or modified designs and only offer a collection of existing designer’s settings. We do both. This means you can choose your ring from hundreds of the best styles, modify features of an existing setting, or use our collection as inspiration in creating a piece from scratch. This multi-faceted offering (diamond pun, intended!) is a rare find in the industry, and one we’ve been proud to provide for our clients for over 20 years. We understand that your engagement ring is extremely precious to you, even before it’s made. That’s why we make sure our clients are included and informed, every step of the way...Even if it means texting you a photo of it’s progress or emailing you a status update after store hours. That level of transparency is our promise from the start, beginning with a step-by-step breakdown of the Freedman Custom Design Process.